Lucky – Used, abused and alone..Greater Sulphur Crested Cockatoo – Approx 15 – 20 years of age. There’s really nothing as magical as the miracle of life. For us Christians we believe God plays a huge role in the creation of life, and for those not believing, creationism/Darwinism and science play key parts in the production of new life. Regardless of “what” we all believe or think, there is something simply amazing as a new life grows and forms and is born live or hatching from an egg. In the bird world, it’s amazing to watch the relationships between male/female of different species and the roles they play in courting, procreating, hatching, caring for and teaching their young how to be a bird and survive. When they are a nestling, they are taught valuable lessons by their parents which they continue to learn as they become fledglings – from that phase its teenage behavior and finally adulthood. From the time the egg hatches until at times 2 – 3 years of age, these beautiful creatures are learning many valuable tools not only in learning how to survive, but in the social aspect of interacting with other birds. Unfortunately, in the world of breeders this is not always the case. Parrots used for breeding are considered “stock” and have no real value except to procreate and make eggs. 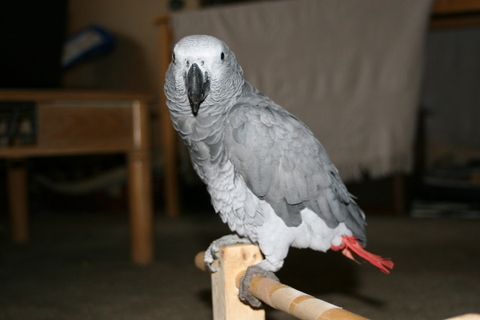 Their lives are not the same as companion parrots who most times are loved/cherished and become members of the family. They are kept in small cages, with no toys/stimulation, minimum quality food and a very lonely existence. This is where Lucky came from. He was simply wanted to breed and produce offspring that could be sold to the local petstores. 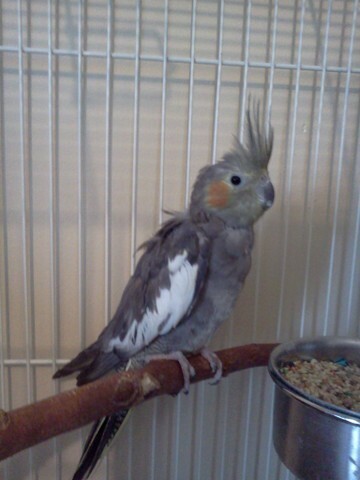 He was kept in a 1 ½ ft square cage (cockatiel size)with a single perch and two food bowls – that was his life – he was not wanted for a companion, he was considered aggressive by nature and would never make a good household “pet”, and when his services were no longer required, he was sold to another breeder to start the process all over again, the cycle for him would continue until he died or was euthanized as he had served his only purpose. In his final and last airport transfer, I was fortunate to intercept him as he was about to be flown 3000 miles away to yet another breeding facility – his current breeder needed him gone ASAP as the female she paired him up with, was not receptive to his advances – things got very ugly and sadly – he killed her. We made arrangements, changed his flight information and on a very cold/rainy Oct evening, we met him at the holding bay at the airport. As I wandered around waiting patiently for this precious cargo, I couldn’t even begin to imagine what he was feeling. Placed in a wire enforced cat carrier, loaded onto a plane, the noise, the cold, was he scared? I hadn’t even met him yet and my heart was already breaking for all he had endured so far. When they brought the carrier to us, he was hiding in the back of it and when I turned it to the light, a black eye stared back at me and he lunged forward, pressing his face against the wire door he reached out his foot and made a kissy sound – as I held his cold foot, the tears really flowed …as I whispered “your safe now baby, your safe”… Once home, I remember setting the carrier down and just looking at him…what a beautiful lost soul..again, wondering in my mind how humans can be so cruel and selfish. When he finally climbed out of the carrier, I was taken aback – this bird was skin and bones and naked, some feathers on his neck and top of wings, but otherwise naked. His left leg had a lesion/scab and his right wing also had a mess going on underneath it. He wasn’t too receptive to touching and we were not pushing him. 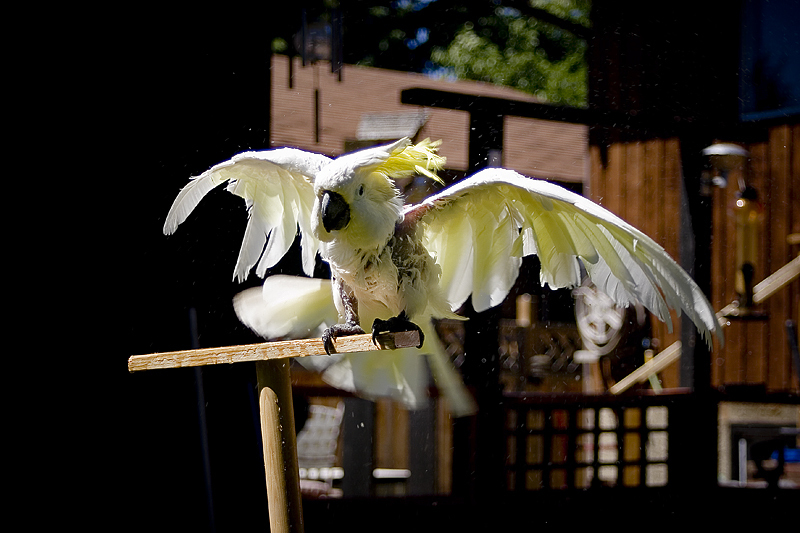 He sat up on top of the cage just bouncing – wing fluttering – and looking seriously happy maybe? Once he had his plate of food in front of him, his train of thought was now gone – that was one hungry cockatoo! Once he was done eating, he was settled into his cage – lured in with a peanut – lightly covered and it was lights out. The following morning found him full of excitement once again – he dove into his food bowl and cleared out the seeds and peas right away, the rest was ignored – with his small size/weight I knew I had to get something into him – so after a huge buffet of food – he finally picked the toast and some warm oatmeal and ate a good breakfast..than it was play time! And he didn’t want to play. He seemed rather hesitant to come out and any sudden movements made him shrink away in fear. We didn’t have exact details of his history – some facts but a lot of speculation – he was an ex breeder, he had been hit by a previous owner – we think because of his screaming – and he was obviously a very picky eater, or not fed regularly. Luckys vet visit went well – nothing severely damaged, incredibly underweight at 458 grams upon arrival – deficient in pretty much every Vitamin and nutrient, nails overgrown, skin very dry, which was cracking and causing the lesions on the leg and wing and plucked naked. This boy had been through quite a time and his body was showing the evidence of that. 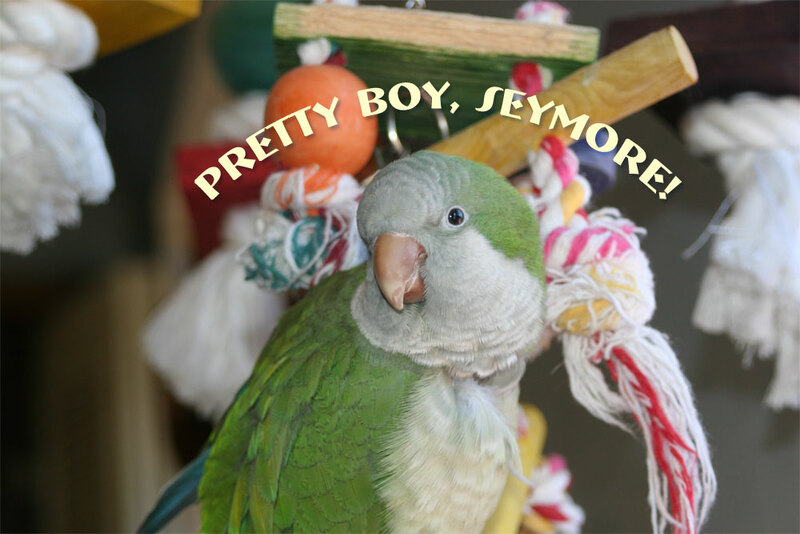 It took a few months, but eventually Lucky started to gain weight, grow back a few more feathers and learn how to play with toys – to this day – toys are still kind of mystery to him and he only has a few favorites. Luckys biggest hurdles have been separation anxiety and learning to trust those around him. He is not an aggressive bird as was previously stated, but he will defend what he believes to be his – an African Grey landing on his cage ended up in emergency surgery to have some toes repaired (shes fine)and Seymore the quaker got a bit too close to that food bowl and lost his beak – other birds have had toe nips without serious damage, but you get the picture. Over the months ensuing, he decided his favorite bird to hang out with was a goffin cockatoo – ½ his size and absolutely terrified of him – to this day – they are not friends – we still have no idea what his true intent would be in having contact with this other bird, and it’s not a risk we are willing to take. But when that bird leaves the room, the screaming reaches an all time high. Lucky has been a challenge emotionally, whatever traumas he has endured have left a lasting impression on him. He is most definitely a screamer when you leave the room – in his cage he will settle down after a few minutes, but when hes out and on his playstand, he will continue screaming until your return, or if the favored goffin leaves the room, the screaming will start and continue off and on until he can see him again. He needs some reassurance that its ok to be alone, and that someone WILL return – he doesn’t like being alone at all which makes finding that special adoptive home for him so challenging. He also does not step up on hands – deeply ingrained is a fear of them – a sudden movement gave me a nasty bite that left me with a thumb that had no feeling for many months – that was the one and ONLY bite he gave me out of fear – this supposedly nasty and aggressive bird – good for NOTHING except being a breeder has given 4 fear based bites in total – in the course of 4 years. Lucky was not wild caught to our knowledge, but he does have abit more wild personality than most of the other birds. He likes his treats, his stands and a scritch – but his favorite thing is his wood blocks/toy box/bucket where he spends hours chewing/digging – this is his safe zone, where he’s most comfortable. You can bring him out of his cage and he can start screaming incessantly – put him back in and he’s quiet and content – this took months and months to figure out – he also needs to sleep in a separate cage used only for sleeping – without this, his level of agitation/screaming is multiplied – hormone season?? Oh yes, 12 hours of sleep minimum for this big boy! Ex breeding birds. What will become of them? Where can they go and who will be willing to take them on with the behaviors they possess. His purpose in life was to simply fertilize eggs – and bring in cash flow. Money. Parrot breeding is all about money and how much can be made, greed, selfishness and lack of empathy for their lives. Provided with mere basics. It opens up a huge debate for many people who believe that an aggressive bird, or a plucking bird should used solely for breeding, to add more birds into an already overpopulated world. Rescues are full of unwanted birds, yet the almighty dollar seems to be more important and lack of education has people rushing to petstores to purchase their new pet – the demand for exotic parrots is high which in turns makes breeders ensure that birds are bred and provided to the consumer. The cost is high to these ex breeders and they pay the price…is it REALLY worth it? Lucky may never find his feathever home, hes a challenging bird to take on for anyone, most want a cute cuddly parrot – which he will never be, but he offers so much more than just being able to snuggle – unfortunately most people don’t see past that part and believe a bird should be snuggled/coddled like a cat forgetting they are wild at heart. Lucky was indeed lucky – he got out. The thousands upon thousands left behind have only one way out..paying the ultimate price to finally be free…with their lives.